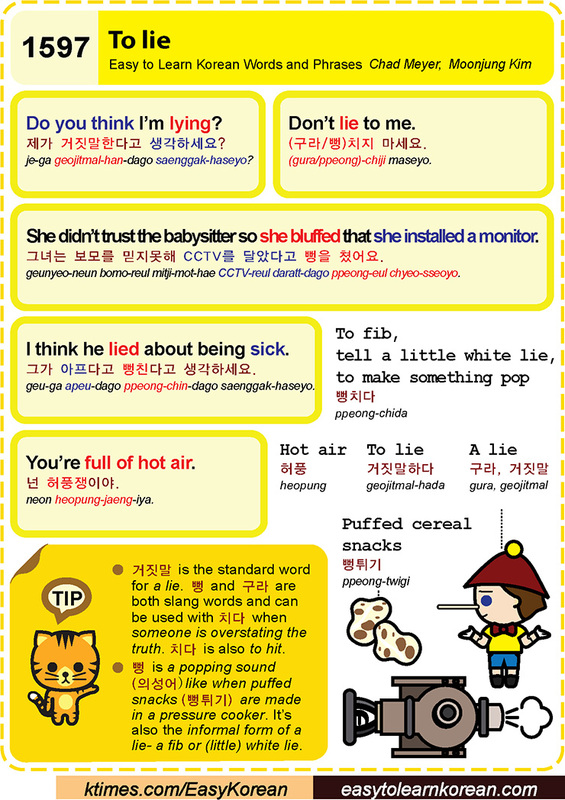 Easy to Learn Korean 1597 – To lie. This entry was posted in Series and tagged (구라/뻥)치지 마세요., a lie, Do you think I’m lying?, Don’t lie to me., hot air, I think he lied about being sick., lie, little white lie, pressure cooker, Puffed cereal snacks, puffed snacks, She didn’t trust the babysitter so she bluffed that she installed a monitor., someone is overstating the truth, tell a little white lie, To fib, to hit, to lie, to make something pop, You’re full of hot air., 거짓말, 거짓말하다, 거짖말, 구라, 그녀는 보모를 믿지못해 CCTV를 달았다고 뻥을 쳤어요., 넌 허풍쟁이야., 뻥, 뻥치다, 뻥튀기, 의성어, 제가 거짓말한다고 생각하세요?, 제가 아프다고 뻥친다고 생각하세요., 치다, 허풍 by easykorean. Bookmark the permalink.